An interview with Hassan Al-Fadhi (2/7/13) originally published on Unite News. My name is Hassan. I’m 15 years old, I’m a student at Glenfield College and I work part time at McDonald’s. Tonight I was working in the kitchen at McDonald’s in Wairau Park [Auckland]. My union organiser, Shane, came in and said that it was a perfect time to go on strike because it was so busy. Nearly all of the people working were members of the union but they were really scared. I thought ‘screw this’, clocked out and told the restaurant manager I was going on strike. I took off my gloves and apron and walked out. My friend Marienne came on strike with me too, even though she was scared before. 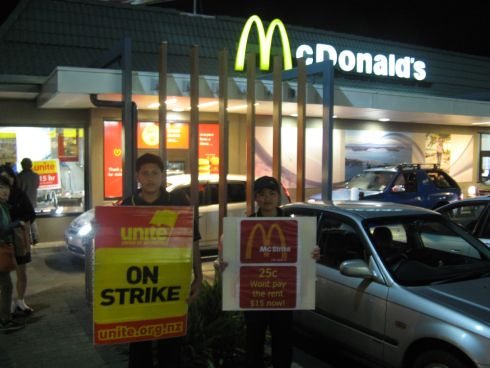 Then we went to Constellation Drive McDonald’s and three more workers came on strike with us. I’m happy that I stood up for myself and I’m stoked that Marienne and the other workers came too. Now that everyone has seen that we went on strike and nothing bad happened I think they will come next time. Why should McDonald’s workers go on strike? McDonald’s workers should all go on strike because we work really hard but we need more hours and we need more pay. When we don’t strike no one listens to us. If they don’t listen the first time we need to keep striking until they do.